As one of the leading corporations in travel stroller industry, Mountain Buggy guarantees to bring high class quality products to users. Therefore, it comes as no surprise that Mountain Buggy Ruby Nano Stroller features top high-end characteristics that become a close companion of your babies. The model not only comes with compact size, but also convenience and high effectiveness. For its great contribution to daily life, it deserves to rank 4.5 out of 5 stars. If you are on the market and get confused by different brands, keep on reading our article below. It fairly evaluates both strengths and weaknesses of this model in a comprehensive way. Nano strollers could be found in different colors and sizes. In addition to black and nautical colors, ruby is one of the most popular options in this day and age. Weighting at only 13 pounds and 22 inches in width, the model is surprisingly compact for easy carrying and moving. One of the most out-standing features of this stroller is foldable ability. 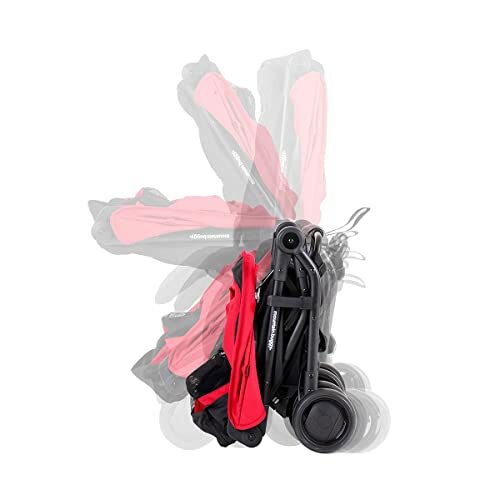 Users will find it easy to fold the buggy to fit your luggage well. Therefore, even you are travelling; carrying the stroller in the plane or putting it under car trunk is not a matter. There is no difficulty in folding the tool. All you have to do is using both right and left hands and following 2 compulsory steps as instructions. To contrast, unfolding the model just requires just only one hand thanks to an automatic lock. It is evidence that Mountain Buggy Ruby Nano Stroller equips the plenty of gorgeous features of an advanced travel stroller. Main parts of the tool could be listed here, including mediocre canopy, runaway strap, roomy seat, adjustable leg rest, 3 point hardness, and handle bar, big mesh window, wheels, suspension and more. Each of them plays specific roles in boosting the stroller effectiveness. Smooth ride and comfort are two most important features when looking at this intelligent tool. Owning to the equipment of 6 inch EVA wheels, it contributes to reduce much noise when moving the stroller. The stroller is efficiently used in many cases and surface conditions. For instance, if you ride it on uneven places, this helps reduce high impact on your babies. This great function results from a helpful rear wheel suspension. You could be rest assured that your babies could enjoy the surprising comfort when lying on the stroller. 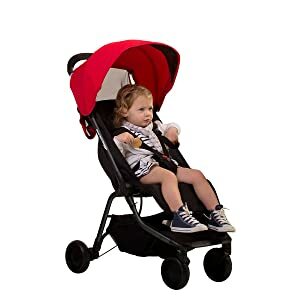 In case the tool is moving in busy airports or streets, it enhances the great maneuverability of the stroller by locking 2 front wheels or swiveling them. A great benefit of using the machine is its high compatibility with most of adapter brands thanks to built-in on-board car seat adapter equipment. There is no additional adapter required for connecting it to the complete travel system. Parents could take advantage of this Nano stroller for many years of use. It allows weight limit of 44 pounds. The model is still great when your babies grow older to 4 years old. Its sturdy frame is created from adjustable leg rest, multi-height safety harness, dual position seat recline and full size seat. There are several important factors that you had better bear into your mind when purchasing a stroller. They include your kids’ ages, types, warranty, and maneuverability. These factors guarantee to help you choose the best stroller for needs and demands. All in all, it’s worth money purchasing Mountain Buggy Ruby Nano Stroller for your babies. The model offers a variety of fabulous features which are appropriate to its price. A good stroller is the great companion for the target of travelling. It helps your babies sit comfortably during long adventures.